New Jersey, Maine And Illinois Fail To Pass Budget, Face Partial Shutdowns : The Two-Way New Jersey, Maine and Illinois couldn't resolve budget impasses, while Washington and Alaska managed eleventh-hour deals. 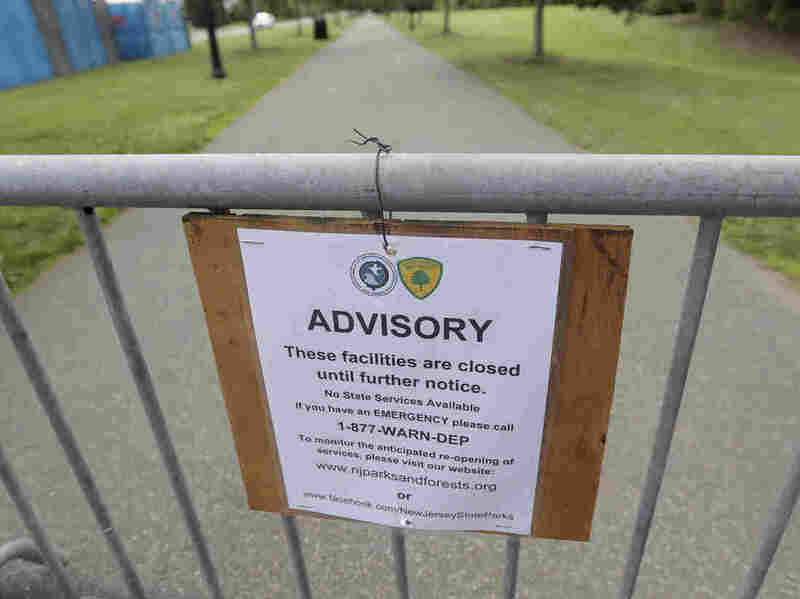 A sign at the barricaded Liberty State Park in Jersey City turns away would-be visitors during the New Jersey government shutdown. New Jersey, Maine and Illinois are all facing at least partial government shutdowns after their legislatures failed to pass budgets. Washington and Alaska managed eleventh-hour deals to avoid a similar fate. Connecticut failed to pass a budget, but the state's governor stepped in with an emergency spending order. The new fiscal year for these and 40 other states begins today. The state is under the second shutdown in its history after the Legislature, controlled by Democrats, failed to reach an agreement by a midnight Friday deadline. The showdown was prompted partly by a rift between Gov. Chris Christie and Assembly Speaker Vincent Prieto. "Christie and Senate President Steve Sweeney agree on legislation to make over Horizon Blue Cross Blue Shield, including allowing the state insurance commissioner to determine a range for the company's surplus that if exceeded must be put to use benefiting the public and policyholders. "But Democratic Assembly Speaker Vincent Prieto opposes the plan, saying that the legislation could lead to rate hikes on the insurer's 3.8 million subscribers and that the legislation is separate from the budget." NJ.com adds: "The legislation, vehemently fought by Horizon, a not-for-profit but tax-paying health services corporation with 3.8 million policyholders, would give the state insurance commissioner next year authority to decide how much money it could keep in reserve." It is the first such shutdown under Christie. The last time the state went into shutdown mode was 2006. The governor has ordered nonessential services halted, "including state parks and the motor vehicle commission to close beginning Saturday," the AP says. However, as NJ.com reported, the Christie family would nonetheless be spending the long July 4 holiday weekend at the governor's summer house at Island Beach State Park. Asked about it by reporters, the governor responded: "I don't know if it's fair, but ... my family doesn't ask for any services while we are there." The AP says that "New Jersey Transit, state prisons, the state police, state hospitals and treatment centers as well as casinos, race tracks and the lottery" would remain open. Thousands of state workers are expected to be furloughed if a budget isn't passed soon. In the 2006 shutdown, 45,000 state workers were affected, but after that budget impasse was resolved, they received back pay. The AP says: "Lawmakers were in the state capital, Trenton, on Saturday to work on resolving the standoff ..."
On Friday evening, Maine Gov. Paul LePage rejected a budget deal forged by a bipartisan group of legislators, forcing a partial shutdown of that state. The Portland Press Herald writes: "LePage signed a proclamation declaring a civil emergency and executive order shutting down state government starting at 12:01 a.m. Saturday. While the order keeps "emergency services" operating — including law enforcement, state parks and some programs within the Maine Department of Health and Human Services — many other offices will close during the shutdown and thousands of state employees will go unpaid." "I'm out of ink," LePage told reporters in the state capital of Augusta, according to The Associated Press. "There will not be a signature on a budget that increases taxes." "The initial House vote followed a lengthy debate. Only Democrats — urging passage of the compromise budget — spoke before the second House vote. "During debate on the initial vote, Rep. Jeff Timberlake, R-Turner, a member of the Appropriations Committee, has led the opposition to the compromise spending plan. He objected to both its contents and the process that led to Friday's vote, which ended with the leaders of the House and Senate negotiating the final details." The state has entered its third straight fiscal year without a budget. "Illinois legislators failed to enact a budget by the end of Friday, the last day of the budget year. While negotiations continued and lawmakers planned to meet over the weekend, the failure marked a continuation of the unprecedented impasse that's left Illinois without a full-year budget since mid-2015. Without a deal around July 1, S&P Global Ratings has warned that the nation's fifth-most-populous state will likely get downgraded again, losing its investment-grade status." The AP says that the failure once again to pass a budget "could mean some universities won't be able to offer federal financial aid, road construction and Powerball ticket sales will halt."